If New Yorkers were able to make a few changes to their beloved city, more green spaces and less stalled construction sites would be at the top of their lists. One such construction site is the Alexandria Center on East 29th Street — but unlike the many eyesores that litter the city, those involved in this project are making the best of the situation. Instead of letting the site be a blight on their landscape, the stalled space has been transformed into an urban farm to grow veggies for NYC’s Riverpark restaurant! If New Yorkers were able to make a few changes to their beloved city, more green spaces and less stalled construction sites would be at the top of their lists. One such construction site is the Alexandria Center on East 29th Street -- but unlike the many eyesores that litter the city, those involved in this project are making the best of the situation. 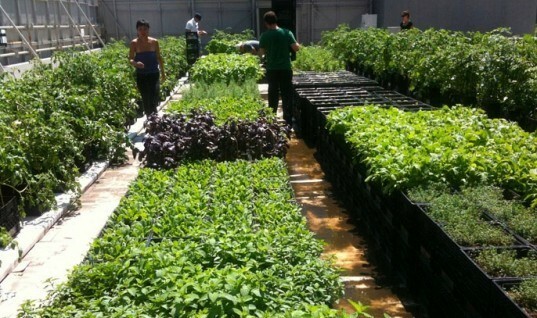 Instead of letting the site be a blight on their landscape, the stalled space has been transformed into an urban farm to grow veggies for NYC's Riverpark restaurant!